Chris Nguyen: Founder, Jobloft.com, and Vice-President, Product, onTargetjobs Inc.
Matt Hornburg: Partner and Producer, Marble Media Inc.
Paul Douglas: Vice-President, Affinity Market Group, TD Insurance Meloche Monnex. In 1971 the futurist Alvin Toffler predicted that the information age would force universities to accommodate an “accelerating pace of change,” prepare for “life-long learning,” and even consider “learning contracts” instead of the conventional degree. I think Toffler had one heck of a crystal ball! So, how do you improve the ability of students to collaborate with knowledge-creating communities that know no geographical borders? What constitutes literacy and critical-thinking skills in the digital age? Most universities have not fundamentally changed since 1971 and Toffler’s prediction. I say most because I’ve watched Ry Hy be transformed into a city builder and thought leader. What’s good for Ryerson has also become what is good for Toronto. Appointed President of Ryerson University in 2005, Sheldon Levy is overseeing a major campus expansion, including the development of the fabled Sam the Record Man site in downtown Toronto. He was educated at Downsview public and secondary schools and earned his master’s degree in mathematics from York University. The Board of Ryerson has already unanimously and enthusiastically agreed to reappoint him for a second term taking his continued leadership into 2015. Please join me in welcoming Sheldon Levy to our podium. Good afternoon ladies and gentlemen. It’s great to be here today. I am delighted that so many distinguished guests have joined us this afternoon. I would like to particularly welcome His Worship Mayor David Miller and Reza Moridi, Parliamentary Assistant for the Ministry of Training, Colleges and Universities. I am also pleased to see many members of the Ryerson community in the room: our Chancellor Raymond Chang; the Chair of our Board of Governors, Peter Lukasiewicz; and students, faculty and staff from across the university. Thank you so much for being here. Ever since I came to Ryerson in 2005, I have been fascinated by the connection between universities and cities. At Ryerson, we have buildings both east and west of Yonge Street, in the neighbourhood of the Eaton Centre, Bay Street, and Dundas Square. We have no ring road around the campus and no boundary in the traditional sense between the university and the city streets. Every day, this wonderful experience makes me realize that the university has a responsibility to be a city builder. We can be the catalyst for bricks and mortar. But we also have to be proactive city builders for our economy, in wealth creation and jobs. We can do this by securing the world’s best talent in areas where we have strength, and the potential to compete on a global level. We can do this by partnering with other universities, with industry, and with government at all levels. Most of all, we can do this by having the ambition to succeed—and the courage to undertake risk and culture change. Back in March 2006, I gave a speech called The University as City-Builder. The main theme was “what is good for Ryerson is good for Toronto.” At the time I was focused on finding more academic space and, to be frank, raising the quality and physical attractiveness of our surroundings. I was also very keen on making Ryerson more visible and, in the process, encouraging some upscale development. We already had a vibrant and diverse community, and I wanted the physical reality to match the intellectual spirit. In that 2006 speech, city building was mostly about bricks and mortar. And I am pleased to say we have made a lot of progress. First, the Ryerson Master Plan. Last year it was completed and approved by the Board of Governors. It was prepared by an internationally renowned master planning team: Kuwabara Payne McKenna Blumberg Architects and Daoust Lestage, with Greenberg Consultants and IBI Group. Everyone was involved: our students, the Ryerson community, and our neighbours. Second, Sam’s. We bought Sam the Record Man on Yonge Street, and also the site where A&A Records and Future Shop used to be. With support from the provincial government, we are building a Student Learning Centre on that site—and it will be a gateway for the university. Third, Gould Street. You might have heard about our plans to reinvent Gould Street by turning it into a pedestrian plaza with cafés, and green spaces. We are now talking with the city about how best to move this forward. Fourth, the Ryerson Gallery and Research Centre. Designed by Diamond + Schmitt Architects, we have already started construction. The gallery will be an international academic facility for teaching, research and exhibitions. And it is home to the Black Star Collection, donated to Ryerson in 2005. This is the largest gift of cultural property ever given to a university in Canada—nearly 300,000 photographs as seen in magazines like Life and the Saturday Evening Post. The collection is so significant that the Washington Times said: “The transfer of this American photography collection to a foreign university, even one just north of the border, is a stinging loss for this country’s cultural institutions.” Through the gallery we will make these amazing images accessible to the public. And I want to acknowledge the support of the city of Toronto in helping us with this project. So, a lot of progress has been made. Now let’s put it all together. Imagine you are walking west along Gould Street, which is closed to traffic. You see the gallery, and cafés, and then you turn onto Yonge Street, and see a new building where Sam’s used to be, with modern and attractive retail at street level, and the Ryerson Student Learning Centre above. When you think about city building this way, it is a picture of bricks and mortar. But when you imagine the Student Learning Centre—and research at the gallery—it is so much more. Along with bricks and mortar, there is another kind of city building. And today I want to talk about city building in terms of the economy—knowledge, wealth creation, and jobs. This is what city building relies on: securing the world’s best talent in areas where we can compete globally—and develop strong partnerships—because our ambition has raised the stakes. I have to start by saying that I wondered if I could give this speech as I intended, in the light of the economic downturn. But, when I thought about it, I realized the current situation only serves to invest our ideas and plans with even more urgency. In the February issue of Toronto Life magazine there is a great article by political columnist Philip Preville. It is called The Good News About the Bad Times. The article suggests that Toronto can become a global financial power and I believe this is well within reach. The second insight is about the rise of technology. The article says the Toronto Stock Exchange is second only to NASDAQ in the number of technology firms in its listing. Taken together, the decline of manufacturing and the rise of technology represent a major shift in our culture and, he suggests, a tremendous economic opportunity. And he asks a pointed question that basically says our future is up to us. And that question is: “Does Toronto want to play in the big leagues or not?” The Ryerson answer is a definite “Yes!” And I have reason to believe it is also the answer all of us want to give. The keys to success, as I have said, are attracting the world’s best talent in areas where we have the potential to lead, exceptional public and private partners, and raising the bar with very high ambition. In Ontario we are moving away from manufacturing, and into technology and I would refine this by saying we are moving into digital media. Last year, when the provincial government released its Innovation Agenda, it identified digital media and ICT, or information and communications technology, as a priority for investment. The report recognizes that Ontario is a global leader in these industries. There are over 5,000 digital media and ICT companies in Ontario—Canadian companies like Rogers, Research In Motion, Open Text, and Mitel Networks; foreign multinationals like IBM, Microsoft, Cisco, Dell, and Motorola; and a new generation represented here at the head table with companies like marblemedia, onTargetjobs, and Delvinia, and leading-edge research and teaching. The Ontario entertainment and creative cluster is the third-largest in North America after California and New York. And the global market for digital media was projected to reach $1.5 trillion by this year. So when we think about city building as an economic activity, we have the foundation already in place. I want to recognize there is strength and innovation in a number of areas. I know Ryerson is not alone in developing other initiatives designed to move Ontario and Canada forward in the world economy. But today I am focusing on digital media because it is a major area where I believe we can bring together the world’s best talent. We can partner with universities, business and industry, and government at all levels. We can be confident that our ambition is well-founded, and it is worth taking the risk to change our culture. Part of that culture change is among the universities themselves. While we compete with each other, we also have world-class strengths we can combine to take Ontario and Canada forward in the global economy. For example, we have OCAD, a university renowned for creative design and York University, our leader in advancing multidisciplinary study and collaboration. In fact, in a newly formed partnership, the University of Waterloo, the University of Toronto and Ryerson are talking about collaborating to create a real force in digital media together, visibly centred in downtown Toronto. And this is just a beginning. Our strategy will focus on attracting the strongest researchers and innovators at our universities and others in Ontario, Canada, and internationally. The partner universities will develop a graduate program that will train the world’s best students to design solutions for advancing the digital economy. These students are the first generation growing up completely digital. So they bring a measure of real comfort and confidence to problems that rely on digital tools for a solution. Our approach is going to be a practical one, where industry, business and government tell us what the economy needs. Our goal is to devise made-in-Toronto solutions for i-banking, i-business, i-news, i-industry, i-medicine, and i-everything. Maybe the best way to differentiate what we are planning to do is to use a manufacturing analogy. If we are okay with implementing solutions designed somewhere else, then a branch plant mentality is enough for us. But our ambition—and the reality we are working toward—is that Toronto will design the solutions, that will be implemented by others. Digital media is highly competitive. So there is risk, and it will be a challenge. At the same time, I have to ask myself, “Why can’t the next Silicon Valley be in Toronto?” And the answer is, “Absolutely, it can happen here.” But we have to be the designers, not just the implementers. It means engaging the world’s best minds on the most challenging and difficult problems that have yet to be solved—and, to me, one of the most exciting parts of this is that our very brightest young people will be taking the lead. It means industry creating an environment where our talent has a place to land—so when we graduate designers who can keep Ontario and Canada several leaps ahead, they do not go elsewhere, because “here” is the most exciting place to be. This is the level we want to achieve—and I believe we can. But, and I keep coming back to the question in Toronto Life, we have to want to play in the big leagues. We are at a crossroads and it is not easy. If you simplify our choices, we have to recognize that health and manufacturing are getting the most attention right now. All of this is good and necessary, but it does not provide for our children and their future. I believe we have to adjust the balance to see the importance of education and digital, and Ryerson University is urging that shift in culture. •	and know our ambition is worth the leap. Because a leap is what we need. I am a mathematician, and in mathematics you can go forward in various ways. One way is linear—step by step. It’s logical and safe, and it gets you there. Or there is something else: a discontinuous function, which means today at 9:01 you’re here and at 9:01 you are somewhere else because you’ve taken the leap. A discontinuous function makes people nervous—but a linear process of one hundred steps means that 50 people get there before us. For my university, my city, my province, I want more. I have very high ambitions and I know that Mayor Miller and Premier McGuinty share my enthusiasm. I have confidence our partnerships would be vigorous and productive. And I believe we can invite the world’s best to join us, because some are already here. It is a prescription for economic success. v And this is where city building links the economy back to bricks and mortar. Anyone who has been to New York city lately knows the Apple store on 5th Avenue. Hundreds of thousands of people gravitate to that store. It is a magnet. Imagine if we had this on Yonge Street. Think about taking the walk I mentioned earlier in this speech. You are on the Ryerson campus, some time in the not-too-distant future. You are walking along the pedestrian plaza on Gould Street, past the gallery and the sidewalk cafés and around the Sam’s corner. There before you, all along that block, is the Toronto digital destination. On Yonge Street, from Gould in the south to Gerrard in the north, we have a corridor of high-end digital stores all in one cluster and the block hums with activity. This is because we have turned our ambition into reality. It is all possible with the right choices. We can choose to be satisfied with being “important but unnoticed,” or we can play in the big leagues. There is no question at all that Ryerson’s decision is to “go pro” because this is what city building means to us. It is quality bricks and mortar for sure. But it is just as much about city building in terms of education, the economy and jobs. And these elements of city building are closely inter-connected. It is all doable! We have great university and industry partners. We have support in principle from the city, province and nation. And now we need to take the leap—to bring the world’s best talent to Toronto in an area where we can leverage strength into a global economic position. I have confidence, courage and faith we can make it—and we are all partners in this important goal. Tomorrow is Toronto’s 175th anniversary, and I think it’s the perfect time to express our renewed confidence in our city. At a time when the downturn in the economy asks us to think hard about our priorities, we can help ourselves by working together to determine our own future and success. Please join me in making digital a priority, and having the courage to make Toronto a really great city of the world. The appreciation of the meeting was expressed by Sylvia Morawetz, Principal, S.A.M. 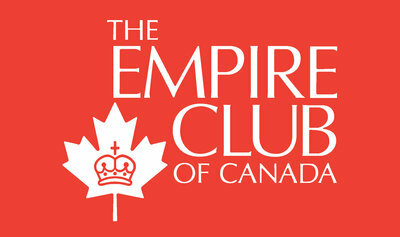 Solutions, and Director, The Empire Club of Canada.